So, I’m pretty much in love with Azure Standard. I’d heard about it for a long time from my friend, Laura from Heavenly Homemakers. However, I’m a little chicken when it comes to trying new things–especially things that require forking out a monetary investment. However, my local friend, Angie, researched out how it all works and what the best deals were, and she held my hand through the whole process. She even let me order with her so that I didn’t have to worry about the $50 minimum (though I actually ending up ordering a little over $50 when it was all said and done). 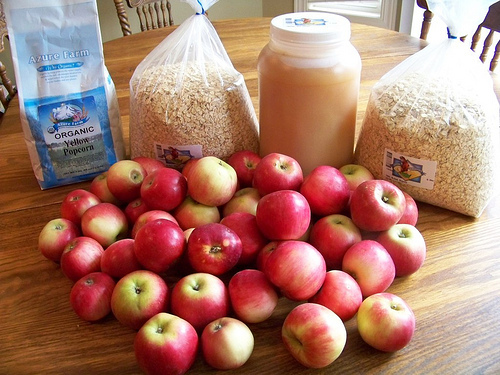 And then we split the 20-pound box of apples. I am so glad I took the plunge to try something new. Not only was it really quite simple and uncomplicated to order and pick up our order from the delivery truck, but I am so happy with what I ended up buying. 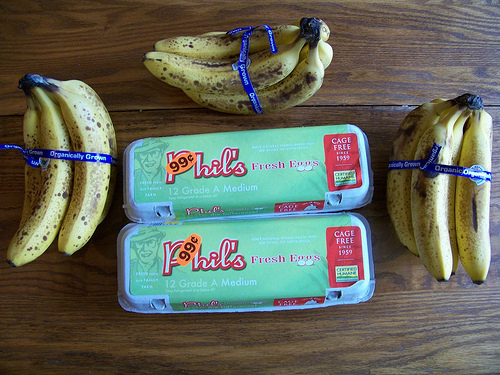 I also stopped at the health food store today and bought some organic bananas that were marked down to $0.39 per pound and some eggs that were marked down to $0.99 per dozen. Earlier this week, Jesse stopped by Dillon’s and Aldi for me and bought lettuce, cilantro, cheese, honey, flour, milk, peanut butter, chocolate chips, tortillas, black beans, and lemons/limes. In the hubbub of preparing for the garage sale, I didn’t get a picture taken. He spent a little over $22 total. Enjoy your apples. Will you be making anything special with them? Do you have a good apple butter recipe? I love it but have no idea how to make it. As far as I can remember, I’ve never made it before! One of my goals was to make homemade apple butter this year, so I’m planning to do that sometime in the next 4-6 weeks and I’ll be blogging about it. I have a wonderful slow cooker recipe for apple butter! It is super easy and delicious. I am usually able to can 10 jelly jars worth of it out of this recipe. If anyone wants it let me know, I am happy to pass it along! Jill, I would love to see your recipe for slow cooker apple butter. I have also made it using pear sauce (I make applesauce and pear sauce). The pear butter is sweeter and a huge favorite! Azure Standard also isn’t available in my area 🙁 Oh well, I guess! Hi, I was linking up and left the computer, came back and my kids had been on it! It now shows my name instead of my deal’s title, Sorry! I don’t know how to fix it, but would love to get my name off of it! I changed it for you; let me know if that’s not what you wanted it to say! Thank you! That’s great & I love Azure, everything I have ordered has been so awesome! It is well worth the investment. We live in their delivery zone. From what I’ve heard, it’s only a good deal if you live in their delivery zone. Is this a mail order catalog company? It looks like anyone can order non-perishable stuff from them, correct? We live in their delivery zone, so we picked it up from the delivery dropoff point. I have been a memeber of my points. It is really easy. I used a junk email address. I get emails from them and click on them to read and deleate them and I get 5 points. You can also do survey’s to get more points. You need over one thousand points which is easy to get and you get a 10 dollar gift certificate. We kept saving all our points and got a 25 dollar lowes gift card which came in handy when we bought our first lawm mover. We also use My Points and like it. We save up all our points earned throughout the year and then use them to buy gift cards for Christmas presents. I’m so excited for you to try Azure Standard! I love them. I thought you would like them! Buying in bulk is fantastic! My next plan is to buy 50 lbs of oats from Azure Standard, since my local source for bulk oats doubled in January, making Azure Standard the lower price now. They also have a fantastic price on pearled barley as well. We have several drop points in our our city, though I was recently told that one that was just a few blocks away is no longer valid, as that person moved. Still, I have plenty of options. I’ve never heard of Azure Standard! I’ll have to check them out. Azure is wonderful, much cheaper and more convenient that the health food stores here. My family has been ordering from them for about 20 years and have been nothing but pleased with their products and their service. I was laughing a little as I didn’t even realize they sold oats in that small of bags!! We always ordered 50-100 lbs at a time! I love buying a gallon of molasses from them as well! They have great prices on bulk spices too! I downloaded their catalog and LOVE the prices! If I’m reading correctly, they will do a “drop” anywhere if the total is over $550? I’m going to call them, just thought I’d see if any of you know. I’m in Eastern Iowa. I’m curious, what health food store do you shop at? We have a few here in Mobile, but I’ve not stopped in yet to see what they have to offer. You always seem to pick up some great deals! Awesome shopping trip this week! It’s a local store with only one location in our town, unfortunately. Thanks for the opportunity to link up, Crystal! I know in the past you have had a budget of $40 a week for groceries. I’m wondering if you have upped that amount. I have a family of four (soon to be five) and have had the $40 goal as well. I just can’t do it now though. Grocery prices seem to have gone up and I guess my growing family is eating more 🙂 Have you been having that trouble too? Thanks for all you do, Crystal. You have been an inspiration and spiritual encourager…I have showed all my friends your blog and they love it too! We are a family of four and have a budget of $40/week. I’ve found that making the menu for the week really helps (including planning snacks). I plan meals off what’s in the pantry and then create the grocery list after that. We eat rice and beans, have cut back on cereals, we also eat meat too but I have found ways to cut back on that too. It’s not easy to do but it’s possible! Am I the only person who finds it strange and annoying that you can’t even see prices on their website until you create an account? And I couldn’t find out where their drop points are. I guess I’ll stick with my local bulk foods store. Give them a call. Their customer service is fantastic and they’ll let you know about drop points in your area. The drop points aren’t actually on their site, just their route maps. I jumped on the Azure bandwagon earlier this summer and I have been so pleased. Our drop coordinator is moving, but thankfully someone else stepped up to handle things. Some of the produce deals are so awesome! I also took the plunge and ordered from Azure Standard a few months ago, and I am in love! The quality and prices of their food is great! How are you going to store all that honey? We go through it pretty fast, but doesn’t good, raw honey crystallize quickly? We put it on cereal and toast. I wish Azure Standard was available here in Ohio, would love to take advantage of their deals! I have not tried Azure yet but I will look at their catalog and see if they deliver in my area. Another bulk food store that I have been very pleased with is Country Life Natural Foods. I have ordered raisins, walnuts, oats, wheat berries, cereal, rice, peanut butter…You can view their catalog at http://www.clnf.org They require a $500.00 food order if you want it delivered for free. They also charge no tax. You can order under $500.00 but you would have to pay for shipping. If you live in their area you can pick up your order. This is wonderful. I signed up last night and we hope to make a big purchase in the upcoming weeks. Apples and Pears are the best produce deal right now because they are in season. This is fantastic! Can’t wait to stock up! Is Azure a good place to buy gluten free products? My daughter is gluten free and I have a hard time finding good stuff for her that’s local, I have to go way out of my way to go to a Trader Joe’s or Whole Foods. I just went on their website and attempted to order. I had ketchup, popcorn and 1pd of chili powder my total was 56..after shipping and tax 97! Is that normal!? PHEW thats a lot! It’s only a good deal if you have a local dropoff point in your area–that way you don’t have to pay shipping.